This summer there are new food options at Starbucks. I thought I’d give you a quick run-down of what’s new. 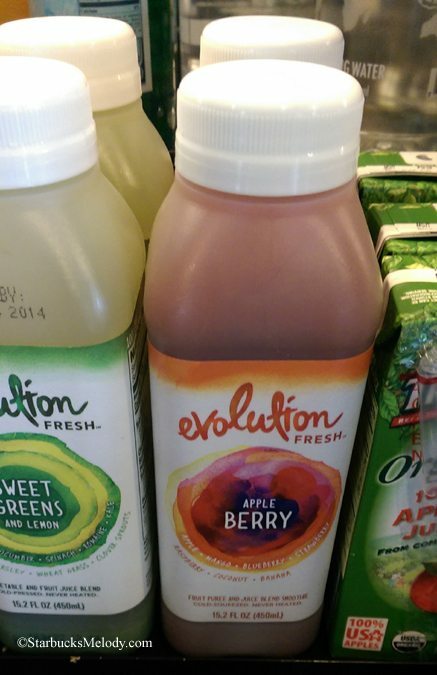 There’s a new Evolution Fresh juice that has shown up at Starbucks stores. It’s the Apple Berry juice. I’m pretty sure that the Apple Berry juice replaced the Organic Ginger Limeade in the stores – to me, this is an improvement. I’m not much of a fan of ginger anyways. Try this! It’s a nice balance of berry and apple, and it’s a little heavier than just a typical juice (I think it’s the banana on the ingredient list that makes it takes a little heavier than a typical juice – it’s like half way between a juice and a smoothie). Also new is the Sausage Croissant Roll. It tastes like a little hot pocket. It’s really delicious, though quite filling! I’d recommend that you get this when you’re super hungry. I’ve heard a number of partners say that this new item is selling well at their store. Again, delicious but heavy. The Devil’s Food Doughnut – This is also new as of June 24th. This is a classic, glazed chocolate doughnut. I had posted about new food items on this blog’s Facebook page, and much to my surprise, a number of partners commented that their stores didn’t get this item in. That surprises me. I’m not sure if this a regional item or not. It’s a good doughnut. I enjoyed it, though I don’t eat a lot of doughnuts. To be clear, my objection to doughnuts is mostly that they’re empty calories – I’m still tempted by this though. I’ve heard a couple of partners comment that they didn’t like the texture of this doughnut, but I didn’t notice that at all. I’d be curious to hear if you’re in an area that didn’t get this doughnut. 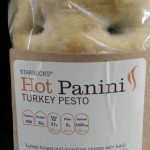 Hot Turkey Pesto Panani – Once again, Starbucks delivers a delicious panani. They’ve really done an amazing job of offering some very quick, nice light lunch options. This is delicious. There is light pesto sauce but you can taste it. It has a generous portion of turkey. It feels like a good, delicious quick meal. This is also an excellent option to use a MyStarbucksRewards reward on, since the price of the panini is just under six dollars. If you’re not a part of MyStarbucksRewards, get a Starbucks card (like the kind available at the register), put money on it, and register it at Starbucks.com. “Join Our Loyalty Program” link at Starbucks.com. Two thumbs up. The Grilled Cheese Sandwich -I had such high hopes for the grilled cheese sandwich. I had heard it had done very well in testing! I tried it and I was left with the impression that it’s expensive and boring. Two thumbs down. I hope you’ll prove me wrong in the comments – maybe you love it! Hope you enjoyed the new food review. The food changes all the time at Starbucks so I’m sure I’ll be doing this kind of article again. And of course, all of this is very subjective! So far no doughnut here and will have to look for the juice. I have been hesitant to try the grilled cheese and now based on your review I think I will skip that. I continue to find that SB seems to miss a large customer base as it relates to new food offerings. Everything seems high in fat, high in sugar, meat related. I can’t believe I am the only customer looking for alternative options. And I have no Evolution Fresh stores near me. I tried the Sausage Croissant Roll tolday for the first tine. I agree it is filling but I would like there be to more sausage in it. I’ve also had the Grilled Cheese. While it’s no Tom & Chee sandwich, it is still tasty. I would have liked it have bacon in it but that’s my only complaint. The food I’ve tried is generally good, but, ALL of Starbucks’ food is so GROSSLY overpriced that I refuse to feed that beast. I really like the grilled cheese and I loathe the apple berry. We just fall on opposite ends of the taste spectrum! @Tom in Plano – I never think about the food in Seattle being overpriced because it seems to fit right in with the cost of living in Seattle. And I always remember that the cost of the food is designed to absorb the amount that gets tossed at the end of the night, so there’s no empty cases, and the labor and store overhead. However, on the other hand, spending nearly $5 on what looks like bread and cheese definitely can feel pricey – there are specific items that appear to be priced a little high. I totally agree with you about the grilled cheese. I tried it a few data ago and was rather disappointed; I drove to two different stores to get it, and when I finally ordered it I forgot to use my MyStarbucksRewards reward on it. It looked so promising, but I just found it flavourless. Good thing I split it with someone so I didn’t have to waste so many calories and fat grammes on it! 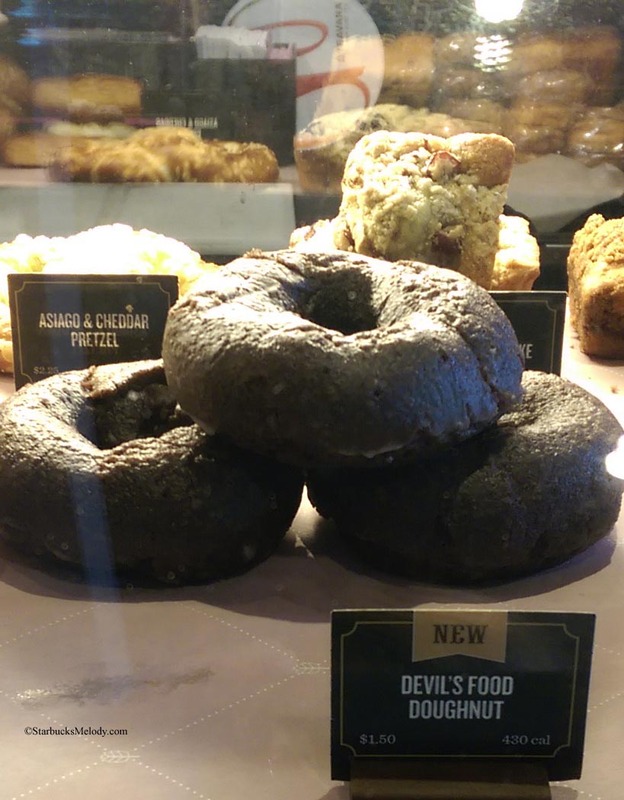 i believe the devil’s food doughnut was only launching in 1,000 stores. my store has it, and eh, it’s ok. I was surprised they name it that, instead of toasted cheese which is more accurate. Haven’t tried it but all of my customers and partners enjoy it. I really enjoy both of the new sandwiches! I find the grilled cheese to be extremely filling, gooey, and tasty. The turkey pesto is delicious! I nice replacement for that awful turkey rustico panini. 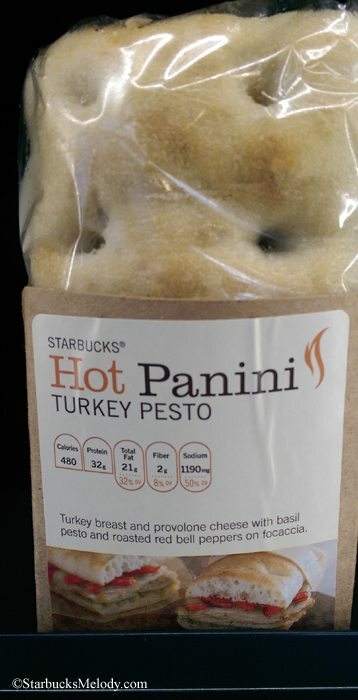 I haven’t tried the grilled cheese yet but as a vegetarian, I’m glad to see another thing I can eat at Starbucks on the run! The juice swap is a disappointment, the apple berry is not something I would drink & I really like the ginger limeade. Melody are you a grilled cheese person? I love grilled cheese, but your review makes me not even want to bother. Honestly the idea of a precooked sandwich being reheated is a turn off anyways. 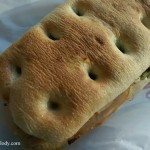 I have never found any of the sandwiches appetizing. I looove the grilled cheese. Simple and classic!! 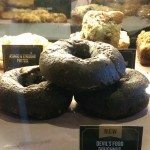 IDK if the devils food donut would do well in my area. I don’t remember chocolate donuts selling well when we had them years ago. The turkey pesto is good. 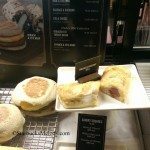 We tried sampling it in my cafe, and that sandwich is so hard to cut into bite size samples! LOL. The grilled cheese sandwiches are not pre-cooked, just pre-assembled. No doughnut here to be found! I haven’t tried the grilled cheese, looked too boring for me. 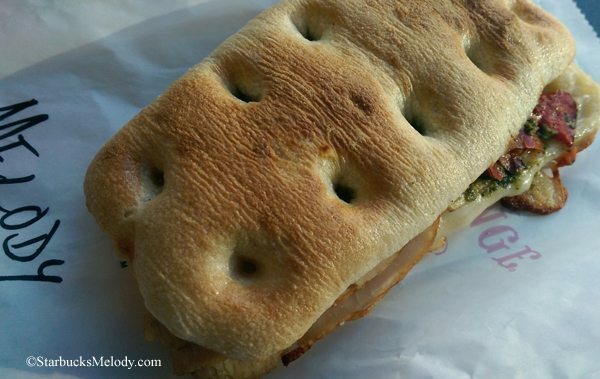 I tried the Turkey Pesto sandwich, thought it was alright, but I don’t think anything is going to top the Tomato Mozzarella sandwich for me. That’s what I use every reward on! I saw the Sausage Croissant Roll in the case today but was afraid to try it. It looks too much like a pretzel dog like you’d see at Auntie Annie’s pretzels at the airport. I’m sad to hear the grilled cheese is lame. I love grilled cheese in general. I second the other person’s comments about the egg and cheese sandwich being lame. I was really disappointed by it, it felt like a Duncan Donuts crappy fake egg patty. And finally, I, too, have been kind of wondering why I pay these high prices for these pastries when I don’t really like them that much. I was at Aldi a few days ago and picked up a package of six cheese danishes for $2.69. Even if I only eat three of them and throw the others out, I’m still saving money over getting a Starbucks one every day. I tried the grilled cheese today with my daughter, and while it is cheesy we agreed it needed something like marinara sauce or a tomato perhaps???? I use my rewards for most of the food items as they are sometimes more pricey than the coffee! And I loved the apple berry juice! Another issue I wanted to mention, but, forgot previously. NO CONDIMENTS! Particularly at the sandwich prices, where’s the mustard? Last time I bought a sandwich at Starbucks, I asked for mustard. “Sorry, we don’t have mustard.” Really? You sell a deli sandwich with no mustard? Starbucks has never been a lunch destination for me, and it will probably remain that way. However…… On the 4th of July I ordered my coffee and Banana Loaf. While waiting in line, I also noticed the new items on display. For some reason, the Roasted Tomato Mozzarella Panini seemed to be calling me back to the line. I couldn’t resist and returned to the line to order one. Quite honestly to my surprise, I actually really liked it. Of course, I think it’s a bit overpriced for that size of bread with a little cheese, pesto and a few cherry sized tomato’s, but it was very tasty. im in nc no panini or doughnut here..we do have the grilled cheese and sausage roll..both are super hot sellers as of now but we’ll see. i do with they used different bread on the grilled cheese though. As a partner, I can’t figure out why people have Starbucks for lunch (unless it’s a reward). The breakfast sandwiches are ok and the pastries are fine, but I can go to almost any fast food place around and get a whole lunch for the price of one of our bland deli sandwiches, paninis or bistro boxes. @Kristen – LOL!!!! Most Partners at the Starbucks I go to run across the street to Panera, Chipotle or to Potbelly. I am in Atlanta and our store has not seen the doughnut. the turkey pesto paninis are selling like mad though. the grill cheese is doing ok and i like it although i think it is way too expensive. i hope we do get the doughnut, it sounds good to me but then everything chocolate sounds good to me. We don’t have the donut here in Sunbelt either. I’d rather it stay that way for the sake of my pants size…. LOVE the grilled cheese, HATE the panini! I’ve really enjoyed the grilled cheese, but am disappointed with the turkey pesto panini. There is a lot of turkey on it, but nothing else. It’s soo dry. I haven’t seen the doughnut in Northern California, nor did I see any internal promo info about…hmmmm. Hmmm, after reading the other post I might give the grilled cheese a try. Like someone else mentioned I’m surprised Starbucks doesn’t offer more vegetarian or healthy options. For the partner that asked why people eat lunch at starbucks my best guess is time. I often ate a pastry that was just eh because I didn’t want to take the time for a second stop. Sometimes I picked up a sandwich with my morning coffee so I didn’t have to run out for lunch. I don’t eat fast food, but will eat something quick from starbucks like the cheese & fruit bistro box. I miss the egg salad sandwiches. The Starbucks salads are an OK value if you have to use up Starbucks credit or are trying to make one of the promotions or get one of the BOGO deals on the app. That’s because they use unique ingredients. Generally I find that the sandwiches are a poor value unless they are half off or more, or they come with a drink (as they sometimes do). The one benefit of eating at Starbucks is (or supposed to be) consistency – the same reason why you would eat at a chain store compared to one of the independents. With some stores offering Evenings and some stores not, some places offering certain pastries and others not, it destroys that consistency. At least within a region, things should be consistent. It’s OK if some items need time to launch nationwide, or if certain things are regional. But packaged products can and should be nationwide if at all possible. 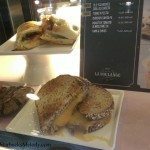 While I am discouraged by reading these posts, after having tried the turkey pesto and finding the meat rather tasty I can definitely see giving the grilled cheese a try. Also, I’ll probably continue eating at Starbucks when on the road as it is more enjoyable than the other fast food I’ve enjoyed lately. I knew by seeing it the “grilled cheese” thing would be a failure for me. I did get a taste of one and found I was right. We (as I said elsewhere) don’t have the chocolate doughnut around here either, which is fine. When I go to Sbux I’m not looking for a doughnut. @Chgo: that Roasted Tomato Mozzarella panini is the one I find the best also….tho I seldom get it anymore. I think overall, Sbux really seems to be in a struggle with their ‘new’ foods and finding what fits where. Shouldn’t be so difficult, imo. A few pastry choices, good coffee and I’m generally set! Denise R right on target and interesting point re the struggle SB is having with food. I agree. I also have said before that SB does not seem to really think about all their customers as it pertains to the food choices. It is an unfortunate thing. As someone indicated in a comment, I did not realize the egg salad sandwich was gone. Is this at all stores? That was a quick choice if I was in a hurry. 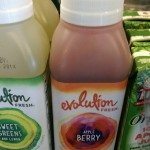 Maryland did not get the doughnut but we did have apple berry since evolution juices started. Never had the ginger limeade. I love the roasted tomato and mozzarella cheese panini. Though I am not vegetarian it is a great choice for those who are. I haven’t yet tried the new grilled cheese but my brother has and he said it was delicious. I also love the new Fizzio sodas, especially the root beer and ginger ale. Considering the space and food preparation limitations Starbucks has compared to other establishments, I find doing lunch there fine and definitely convenient. 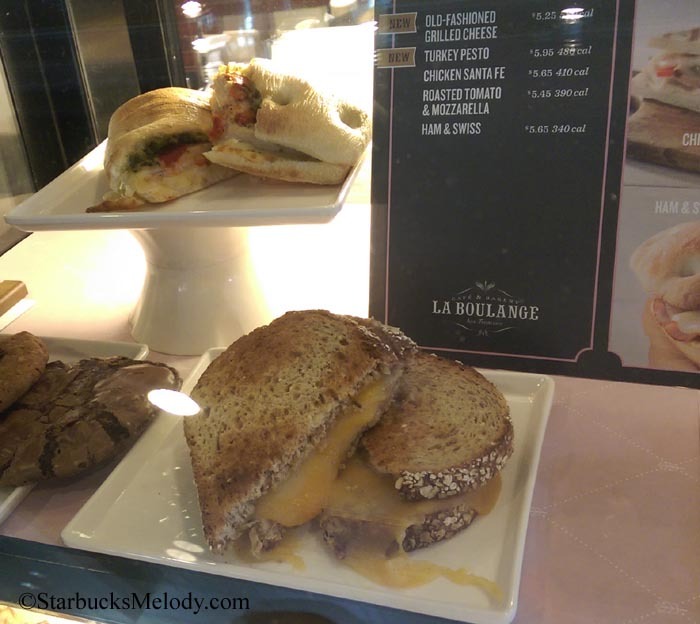 Every time I went to any of my local Starbucks, they were always out of the grilled cheese sandwich. I always ended up with my old standbys, the roasted tomato & mozzarella panini and the spinach feta wrap. Last week, I was finally able to try the grilled cheese. While the bread was good, I thought the sandwich as a whole was bland. I will be returning to my old standbys, the spinach feta wrap & roasted tomato & mozzarella panini. Yum! While I have not yet tried the new Panini or the toasted cheese sandwich, I very much enjoy SB for lunch. My favorites are the chicken BLT sandwich and the mozz & sundried tomato Panini (LOVE those). I don’t mind to pay a bit more money for food that seems to be a much better quality (and generally much less calories) than other “fast food” places. The only bummer is when I am really looking forward to the mozz sandwich and my store is out. First off – as a partner, I really like your site; I tell my partners about it 🙂 Thanks for being a great external resource!!! I would say that 50% of the grilled cheese we sell are requested cut in 1/2 = two perfect kid sandwiches! We really should be required to cut the grilled cheese in half. That sandwich is Big. My store is in the Sunbelt region and we do not have the devil’s food donut at this time. When I have gone to some Starbucks stores, they have told me that they cannot cut things in half, but have given me a knife to do it myself. Other stores are able to cut things in half. Why the difference between the stores? Cutting things in half is not a standard we practice. Starbucks has specific ways for doing everything. Therefore, if we were to begin cutting things in half, they would have to train us to do it exactly the way they want. We can cut things in half upon request, but there have been times when I handed a plastic knife to a customer to do it themself. One incident in particular was a customet requesting I cut his spinach wrap in half. I know that will be a huge mess to cut and to eat. I explained to him that’s not something we get many requests for cutting and the reason why. Rather than risk destroying the wrap and having to make a new one…. I gave him the plastic knife… so whatever happened from that point on was his doing. Has anyone tried the basil and cheese muffin? It is not too bad, but I really wish they would just make more blueberry muffins instead of wasting time on those. LOVE the new velvet vanilla cappuccino though!